It looks like Coca-Cola and Pepsi, long-time soft-drink rivals, have taken their competition to a new level: the federal court. Coca-Cola has filed a $1 billion action against Pepsi for using a glass bottle, which is allegedly confusing because it is so similar to Coca-Cola’s iconic glass bottle, as the Herald Sun reported. Coca-Cola has a registered trademark for their famous glass bottle, which means that no brand, including Pepsi, can use the glass bottle in any of their products. The court will likely compare the two bottles, without their respective logos, and decide whether there is a strong likelihood that consumers will confuse the Coca-Cola bottle with the Pepsi bottle. So, are they similar enough? It depends on who you ask. As a student who always has a water bottle stashed in her backpack, I actually consider the shape of the water bottle substantially similar to the shape of Coca-Cola’s glass bottle. Why doesn’t Coca-Cola go after other brands that use the shape? Well, that’s easy. The answer is competition. Pepsi is one of Coca-Cola’s biggest competitors. If Pepsi starts selling an all-too similar glass bottle, Coca-Cola might lose some control over the soft-drink market. And that’s not something they’ll lose if they go after Poland Spring. Earning nearly $950 million in annual sales and controlling about 70 percent of the soft-drink market, according to the Herald Sun, Coca-cola stands to lose millions. The day the iconic Coca-Cola shape becomes generic? To me, the shape of the iconic glass bottle that Coca-Cola holds onto so dearly has become generic. The curvy shape is merely functional. The narrowest part of the bottle, the middle portion, just makes it easier to hold or grab. Any variations, including the textured waves on the Pepsi bottle, make it more aesthetically pleasing. The standard water bottle also has a curvy shape, which means other brands are using it too. This will likely hurt Coca-Cola’s case. If other brands are using confusingly similar shapes, the court might find that third-party uses of the trademark is evidence that the shape of the bottle is generic. 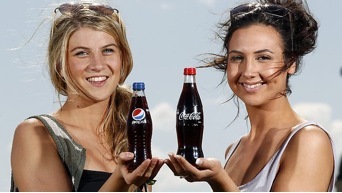 Are consumers really confused between the Coca-Cola and Pepsi bottle? Does the bottle really make you want to buy it? 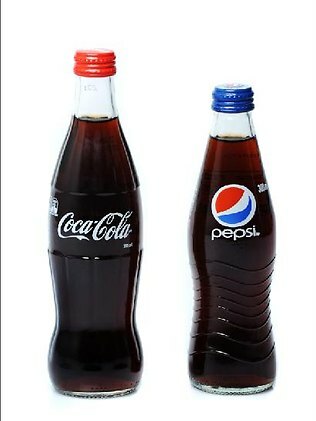 Not the fact that the bottle is glass, or that it’s Pepsi or Coca-Cola, but only based on the fact that it has a curvy shape? It doesn’t confuse me. One bottle is filled with Pepsi and the other Coca-Cola. The distinctive logos are right smack in the middle of the bottle. But in this case, it doesn’t matter. The only thing that will be considered are the bottles, as if the logos were never there or never will be there. It’s hard to wrap my head around how the court will just look at the naked bottles when considering the likelihood of consumer confusion and ignore the clear fact that both brands’ well-known logos WILL be on the bottles when they are sold. And even if the court can just look at the shape of the bottles, would that even be fair to Pepsi? We all know Coca-Cola’s glass bottles gained its fame because it was associated with the soft drink. The shape of the bottle is famous because Coca-Cola made it famous. So when you look at the bottles without their logos, consumers will definitely be more confused than if you look at the bottles with their logos. This is exactly why Coca-Cola is protecting its trademark. At the end of the day, any brand just wants you to buy their product. And they’ll spend millions on marketing techniques to get you to buy it. Coca-Cola is no different. They developed the glass bottle to get you to buy it. And I bet they spent millions to make it the iconic Coca-Cola bottle that we know today. Coca-Cola had built its reputation on the consumer-loving products it sells. This is why they don’t want its main rival, Pepsi, free-riding on that reputation. Coca-Cola made the average glass bottle famous. Now, Pepsi just wants to take advantage of Coca-Cola’s goodwill and reputation just to boost its own sales. Why else would Pepsi want to sell a similar glass bottle? Although Pepsi makes a strong case, this fact alone could destroy Pepsi’s chances of a victory. It’s going to be a close call. Pepsi can argue the bottle is generic and there’s no way the two bottles can confuse the public, while Coca-Cola can argue that Pepsi is merely trying to free-ride on their goodwill and reputation. All I can say is that I’m glad I won’t be the person to decide. It doesn’t look like either of these two long-standing rivals are willing to give up on their bottles.